Eighth release in the Rwandan Wildlife Series! Face value of 50 Francs is legal tender in Rwanda. Features the image of the Cape Buffalo. The Cape Buffalo, also known as the African Buffalo, is a unique bovine subspecies unlike any other in the world. Found predominantly in East and South Africa, it is similar to but not directly related to domesticated cattle or the Asian Water Buffalo. Cape Buffaloes have never been domesticated, and as such remain immensely hostile toward and suspicious of human beings. The Cape Buffalo was chosen by the government of Rwanda and BH Mayer Mint to represent the wildlife series as the eighth animal design. The private German mint is contracted with the government to strike these coins annually. 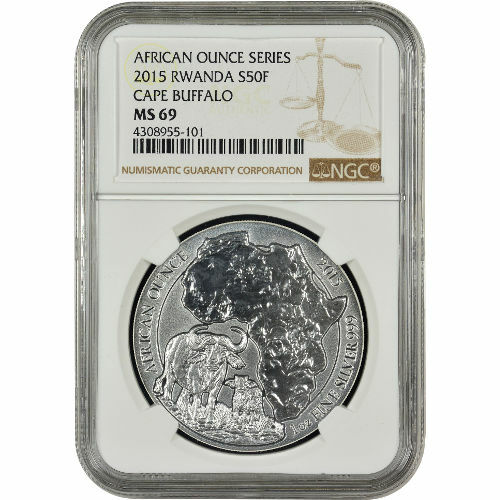 Each of these 2015 Silver Rwandan African Buffalo coins has a near-perfect grade of Mint State 69 from the NGC. Coins in this condition exhibit full, original mint luster, but also feature a maximum of two minor detracting flaws such as miniscule contact marks. On the obverse face of the coin you’ll find the image of a Cape Buffalo, both an adult and a young calf. The obverse face is dominated by the shared design of the African continent, along with engravings identifying the weight, purity, and metal content of the coin. The reverse bears the coat of arms for the nation of Rwanda, along with the national motto. Engravings on this face also identify the Central Bank of Rwanda and the coin’s face value, with each engraving in a local Kinyarwanda language. 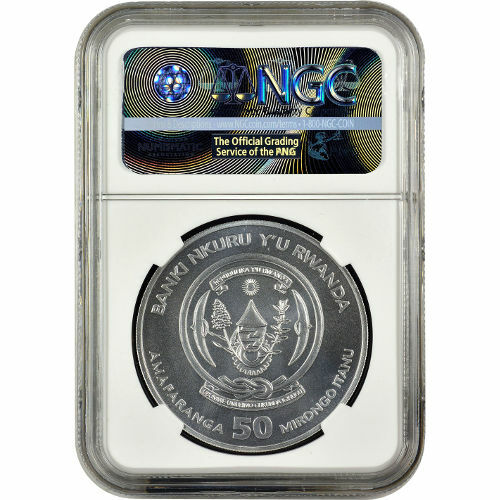 If you have any questions about Rwandan Wildlife coins, please feel free to reach out to Silver.com. Our associates are available on the phone at 888-989-7223, online using our live web chat feature, and via our email address.